Mike Curtis may not have the typical background of someone dedicated to vanquishing bureaucracy. AltaVista, AOL, Yahoo, Facebook — he’s a veteran of some legendary Silicon Valley behemoths. Now VP of Engineering for Airbnb, he's at the helm of a small but rapidly growing team. With nearly two decades of innovation at tech giants under his belt, he's become an expert at chopping through red tape. As it turns out, one simple lesson guides Curtis' approach to building effective teams: the antidote to unproductive bureaucracy is good old-fashioned judgment — having it, hiring for it, and creating conditions that allow people to exercise it. Armed with this truth, he’s tackled the challenges of scaling a world-class engineering team at Airbnb, from taming the beast of expense reports to dramatically improving site stability. And he’s done it by eliminating rules, not making them. At First Round’s recent CTO Summit, Curtis shared actionable tactics for what he calls “replacing policy with principles” that can guide fast, flexible growth and progress. Every startup looking to dodge a fate dictated by increasing structure and processes that inevitably slow you down can benefit from these tips. The curious thing about organizations is that having more people somehow doesn't equal more output. “As size and complexity of an organization increases, productivity of individuals working in that organization tends to decrease,” he says. As headcount grows, so too does the policy-and-paperwork stuff that gets in the way of rapid iteration and scale. Why is this the case? “I think it comes down to human nature and the way we react to problems,” Curtis says. Our natural response to any problem — from a downed server to a social gaffe — is to try to ensure that it doesn’t happen again. In companies, more often that not, those solutions take the form of new policies. “What happens when you create a new policy, of course, is that you have to fit it into all of your existing rules.” And so begins a web of ever-increasing complexity that's all about prevention. Soon, you start to hit safeguards no matter what it is you're trying to do. Minimizing rules that become roadblocks in your organization will only work if you’ve built a team that will make good decisions in the absence of rigid structure. Your hiring process is where you can take the biggest strides toward preventing bureaucracy. No company will ever achieve perfection, ever. So when things break, you want people who will be motivated by solving problems — those are the people who won't pause to place blame, and blame is wasteful. Even if you have a honed process for screening and interviewing candidates, it's worth revisiting how you test for culture fit to make sure this is part of it. Too many companies and engineering leaders are willing to compromise to maximize technical savvy. Do not do this. Curtis recommends allocating at least 45 minutes to an interview that is entirely about culture and character. Diversity of backgrounds and opinions is championed at Airbnb, so ‘Culture fit’ is about finding people who share the high-performance work ethic and belief in the company’s mission. If people don’t share your conviction in the company’s success, they aren’t a fit. 1. Remind new hires they’re working with the best. “I talk about how many people applied for their position so they understand how competitive it is to get into the company and that they're working alongside great people,” Curtis says. Beyond its morale and excitement boosting value, this is an effective way to build a sense of urgency and ensure that new hires hit the ground with positive momentum. 2. Emphasize the value of moving fast. At Airbnb, Curtis’s direction to new engineers is to ship small things first. That can be an adjustment for people used to working on huge systems in their last gigs, but it’s proven to be a valuable way to build that all-important shared judgment. “Get a bunch of code out the door, learn how things work, then you'll ship bigger stuff,” he says of new hires. 3. Make imperfection an asset, not a liability. Share what you were looking for all along: Someone who draws energy from unknowns. “I talk about the fact that the people who are going to be successful are the ones who see things that aren't perfect and draw energy from them,” Curtis says. Make it clear, on the other hand, that cynicism and complaints will not be rewarded. 4. Review your engineering values. When you first start to build your engineering organization, it's good to codify the values that will guide your actions. These can be worded any way that feels right to you. Examples may include, “be biased toward action” or “have strong opinions but hold them weakly.” Whatever you come up with, go through each one, clarifying what they mean to you and why they made the list. “Values can be open to interpretation, so it's good to have a voice-over,” Curtis says. 5. Welcome new hires to the recruiting team. The people who just came through your interview process are going to be conducting them for new candidates before long, so make sure new members of your team understand that recruiting is a major and critical part of their job now. “You want them to treat it as seriously as they do writing a piece of code. They need to be really present for recruiting,” Curtis says. 6. Establish direct lines of communication. Open communication is a powerful remedy for unnecessary bureaucracy — and there’s no message more powerful than telling your team they can take concerns to upper management and meaning it. “Sometimes people feel they need to funnel all communication through their direct management. When you say that they can come to you, to the leadership several tiers up, they know that they can communicate openly across the whole organization,” Curtis says. 7. Conduct a series of initial check-ins. Good habits are established early, so don't let up on your efforts once new engineers are at their desks. Curtis has found that one month and three months are the sweet spots for informal check-ins. “This is super lightweight. All we do is collect a couple sentences of peer feedback from the people around that new engineer,” he says. Share the feedback you receive with the person in writing. It will be a valuable reference point for engineers as they ramp up. And if you hear any causes for concern, address them right away. Sit down with that person and clarify your expectations. It's much easier to shape how someone works early on when they first start at the company than when it's solidified a year in. “We have a philosophy that all managers start as individual contributors. We believe that if a manager doesn't spend a significant enough time in the code base, they're not going to have an intuitive sense of what makes engineers move faster and what gets in their way,” Curtis says. Set the expectation. There’s no sense in surprising a candidate with the news that they won't inherit a team halfway through the process. “The first time I talk to a manager who has plenty of management experience and wants to work with us, I'll tell them straight out that they're going to start as an individual contributor,” Curtis says. Try pairing. Maintain realistic expectations for coding interviews. “If somebody's been out of the code base for the last five years, they're probably pretty rusty, and they're not going to nail it on your algorithmic whiteboard coding question the way a new grad will,” Curtis says. Pairing can be a helpful workaround. “If you didn't get a great technical signal from them, but you've got a good feeling about them as a manager, do a pairing session,” Curtis says. Give the candidate a chance to shine in the context of working with an existing employee. This usually surfaces latent knowledge and gives you a sense of their dynamic with other engineers as they navigate code. Give it more time than you think. The goal is to give managers a chance to really engage with the code base, so don’t rush things — six months as an individual contributor at your company is usually about right. “The point here is to give them a chance to ship something real and establish some legacy in the code before they take on management,” Curtis says. 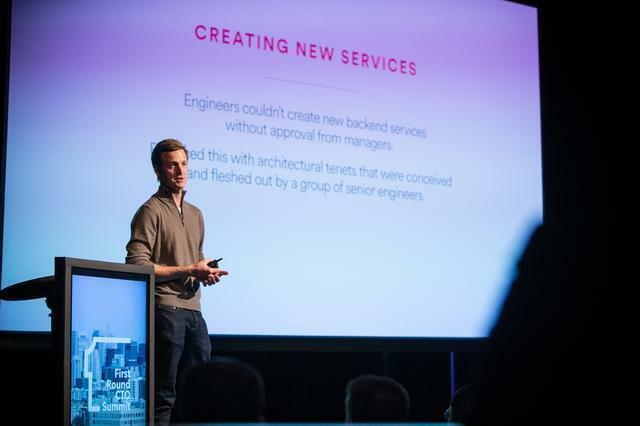 OLD POLICY: Engineers can’t create new backend services without approval from managers. NEW PRINCIPLE: While working within a set of newly articulated architectural tenets — conceived by a group of senior technical leaders — engineers are free to develop backend services. Here’s another case where policy was creating a huge amount of overhead. “You'd have to go explain what you wanted to do to your manager, explain the rationale, get them to understand, and then get them to approve and move forward,” Curtis says. So he tried something new: A group of senior engineers set up sessions to determine the architectural processes that mattered most to the organization, then articulated them in a series of architectural tenets. Guided by that document, engineers are now free to create new backend services. “It might even be okay to go outside of those architectural tenets, as long as you gut-check it with the team,” Curtis says. Make it possible. Before you establish a new priority, make sure it’s feasible within your current systems. “It turned out that a lot of our tooling for code reviews was extremely cumbersome and painful, so it was taking too long for people to even get a code review if they wanted one,” Curtis says. So he made sure that tooling was improved before rolling out this initiative. People can't do what you haven't made possible. If you don't take this into account, they'll be confused and resentful. Apply social pressure. All-hands meetings can be invaluable tools for advancing a culture-shifting agenda. That time together is already booked, so why not make it work for you? “We started highlighting one or two of the best code reviews from the week before,” Curtis says. “We'd have the person who got the review talk about why it was helpful for them and why this was useful.” Your best spokesperson for a new principle a member of the team who’s already bought in. At the end of the day, though, Curtis is not advocating for the unilateral elimination of all company policies. Sometimes you need rules. “A good example for us is when you're traveling overseas, there are very specific policies about what kind of data you can have access to and what kind you can't,” Curtis says. When the health of your organization depends on something that can’t be left open to interpretation, go ahead and make a rule — but do so sparingly. The real trick is to recognize that a policy doesn’t exist in a vacuum — it interacts with every policy that went before it — and adds to a collective mental and documented overhead that adds up the bigger you get. You want to minimize this overhead however possible, and the easiest way to do that is to trust your team, and clearly articulate your values. It really comes down to putting your faith in people with good judgment, making sure you hire good judgment, and then guiding them with principles. If you want to hear more from Curtis, he’s speaking at the OpenAir 2015 Conference alongside Michael Lopp of Pinterest, Adora Cheung of HomeJoy, and many more on June 4.